Hon. 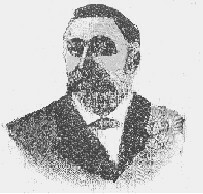 D. Cutler, Mayor of Grand Haven. As ever, only merit wins. Within the last four or five years the newspaper write-up fakir, representing all manner of printed frauds, has become conspicuous in all parts of our country. He has plied his vocation so persistently that, as a result, it seems at times that all mankind has lost confidence in newspaper statements. The newspaper write-up fakir comes suddenly upon a town—from where, nobody knows—and the publication he represents, though it has a high-sounding title, has been heard before. He drops in upon the merchants and manufacturers, and without letters of reference or a recommend, collects money of them freely upon the promise of a few extra copies containing the article that will at once build up their town to the dimensions of a Chicago or New York, and at the same time wipe all neighboring towns off the face of the earth. He collects his money in advance, rehashes a column or two of old newspaper articles, usually abounding in falsehood, furnishes his victims with a few extra copies which they stow away in some back room, and passes on to new fields and new victims. Even publishers of journals with something of a reputation, who have failed to appreciate the fact that "Honesty is the best policy," have given countenance to these swindlers. "That which is worth doing at all, is worth doing well" applies to the advertiser and newspaper publisher with as much force as it does to to the rest of mankind. No people ever made a dollar publishing falsehoods in the advertisement of their business or their towns. Barnum said, "advertise but be sure you have all you advertise." Don’t imagine that you are dealing with fools when you advertise. It is not fools that a town wants to add to her population. Every town has fools enough. The object of advertising is to attract live brainy business men, with money. A lie will repel such men. Only solid facts will attract them. If a city has advantages all the lies in the world published broadcast over the land will not help it a particle. If anything it will destroy confidence in its people. If a city has superior advantages there is always money in publishing the facts to the world through standard publications. The interest of a city with superior advantages may be injured by overdrawn statements regarding them. Facts, and facts only, will tell. People not accustomed to travel too often make the mistake of supposing that everybody is familiar with them and all the advantages of their locality. This is a country of magnificent distances and numerous cities and towns. It is impossible for the great masses of the people to know anything about any particular place or take any stock in it unless it its frequently described in some journal having a large circulation and high reputation for veracity. The writer believes in facts, and facts only—as a matter of policy, if nothing more—and in descriptive articles always attempts to to govern himself accordingly. He believes there is more money in it for himself, the population he represents and the people represented . "In this brief description of Grand Haven, its private and public interests and its great natural advantages only such materials have been used as are based upon solid facts and figures," said one of the most prominent and successful business men of the city. Grand Haven has an ambition to get up a boom. All we ask is the plane statement of facts. We have every confidence that our superior advantages will attract manufacturers and other desirable enterprises as the people are made aquatinted with the solid facts. Residence of George A. Farr. Grand Haven is the capital of Ottawa County, and with its suburban towns of Spring Lake and Ferrysburg, has a population of nearly 10,000. Its citizens claim that they can produce the facts and figures to prove that it has the best harbor upon the east shore of Lake Michigan. Grand Haven has a delightful and healthful a climate as any spot upon earth, the pure air form Lake Michigan tempering the heat of summer and the cold of winter. It is considered one of the greatest summer resorts in the Northwest, and has several public parks and hotels for the special accommodation of visitors and tourists who flock to the city during the heated season. In presenting the facts as to what Grand Haven is today, it is not necessary to commence with the time when the lands upon which the city now stands was the rendezvous of the remnant of the Indian tribes or the home of the fur trader; suffice to say that at the present time Grand Haven enjoys the advantages of two trunk lines of railway; the Detroit, Grand Haven & Milwaukee, the western terminus of which is here, and the combined systems of the Detroit, Lansing & Northern and Chicago & West Michigan. The western terminus of which is also here. Grand Haven is only thirty-one miles from Grand Rapids, with which it is connected by both lines of railroad and the Grand River Packet line. It is only eighty-four miles from Milwaukee, with which it is connected the year around by the elegant line of Grand Trunk passenger and freight steamers. It is only 110 miles from Chicago, the great metropolis of the West, and second city of the United States, with which it is connected by the new and magnificent daily lines of Goodrich steamships. Grand Haven is not a lumber town, but, as will be seen, is a manufacturing city of healthy growth and a great diversity of industries. But one or two cities of Michigan of the same population employ as large a number of laborers the year around. Its two ship yards turn out annually more ships than any other city of its size on the great chain of lakes. 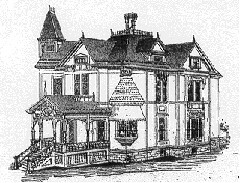 Residence of George D. Sanford. Its principal articles of manufacture are agricultural machinery, refrigerators, furniture, stationary and marine boilers, stationary and marine engines, the celebrated Dake engine, barrels, pails, wagons and sleighs, carriages, steam yachts and clinker boats, leather, harness and flour. 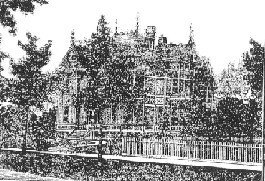 Residence and Grounds of Jacob Baar. Grand Haven is backed up by a magnificent agricultural country. Among the numerous agricultural and and horticultural products of the city of Grand Haven the most important are celery, apples, peaches, grapes, strawberries, raspberries. Celery and the small fruits are grown in great abundance. Grand Haven is governed by a moral and conservative people, and financially every public and private enterprise in operation is upon a solid foundation so far is known. 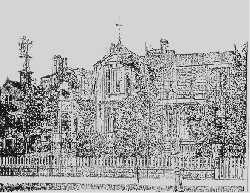 Engraving of Blanche Hall, Akeley Institute. 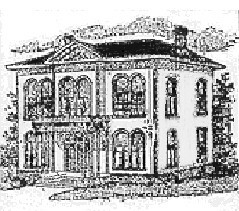 Grand Haven’s educational interests are represented by the Akeley Institute, with which the people of the state are familiar, and a union and four ward schools that will compare favorably with the schools of any similar city. It also has a public library of between three and four thousand volumes. There are twelve churches, opera house, water works, gas works, electric light plant, telephone exchange and three weekly and two daily newspapers. 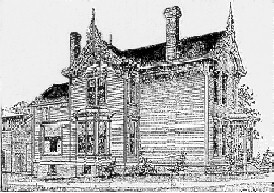 Residence of Dr. J. N. Reynolds. Under the date of Jan 18, 1890, "The harbor of Grand Haven is the most important to the general commerce of any on the east shore of Lake Michigan." Again, "The conditions of Grand Haven are altogether more favorable to the construction of a wide and deep entrance suitable for both local commerce and as a harbor of refuge, in case of need for the general commerce, than at any other point on the east shore." "The piers are 400 feet apart, and the channel’s depth between them as well as in the river above, ranging from three to four fathoms, are ample for the largest vessels." And again, "The status and utility of Grand Haven as a harbor of refuge are such as to make its maintenance and security invaluable to the thronging commerce of Lake Michigan." In order to establish a harbor of refuge at Grand Haven the last Congress appropriated seventy-thousand dollars for the work and necessary cribs, piling and revetments are being now completed. In this connection it is proper to state that Grand Haven has ample water front, yet unoccupied, for the location of manufacturing establishments, which can be secured reasonable. Grand Haven’s location works doubly to the interests of manufacturers. Any article shipped by boat in the evening is on the Chicago market before business hours the next morning. Again, manufacturers in return have the same advantages of the great Chicago market in anything they desire to purchase. A telegram or telephone message to Chicago at any time before six in the evening will insure the receipt of any article by boat before business hours the next morning. The various institutions and enterprises belonging to Grand Haven, and of which space forbids any extended description, will compare favorably to those of the most advanced towns of her size in this country. Is a very popular summer resort only a mile from the center of the city which may be reached in five minutes. It has already nearly a hundred cottages of the various styles known to popular watering places and more are being continually built. Highland Park Hotel is located about the center of the park upon a high bluff overlooking Lake Michigan, and has many attractions for families seeking a cool and delightful place to spend the summer. The park has one of the finest sand beaches for bathing, shallow out into Lake Michigan a distance of 250 feet. The slightest accident has never yet occurred here. It is one of the safest and most healthful places for children in the world. The hotel has 10,000 square feet of of steps approaching the front, and verandas 600 feet in length and 14 feet in width. Mrs. Rice of Milwaukee is the manager of the hotel. 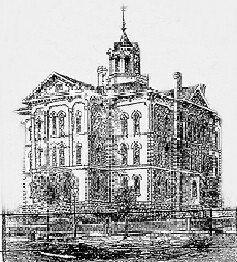 Engraving of New Akeley Building. Akeley Institute is the diocesan school for girls in Western Michigan. 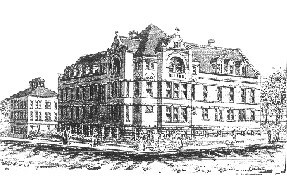 Opened in September, 1888, the institute has during the three years of its existence been remarkably successful. There are at present three buildings, which, with the grounds are valued at $65,000. The life of the boarding pupil is more than that of an educated Christian home than a school. The entire course of study of the institute comprises four years each, in preparatory and collegiate departments. The institute is under the supervision of the Rt. Rev. George D. Gillespie, D. D., Bishop of Western Michigan. The most popular engine now in use for many classes of work is the Dake, invented by William F. Dake of this city, and together with other inventions of Mr. Dake, manufactured by the Dake engine Company. The plant has been in operation about four years and has a capital stock of $100,000. They turn out more than an engine a day upon an average the year around. The company has patents in this and other countries valued at $50,000. These engines are much more compact than any other engine made and may be reversed with lightning rapidity. They are adapted to all uses where steam is required, and the sales upon them are rapidly increasing. The officers of the company are Thomas Cairns, president, and James P. Armstead, secretary and treasurer. The company has a monthly pay-roll that contributes largely to the prosperity of Grand Haven. 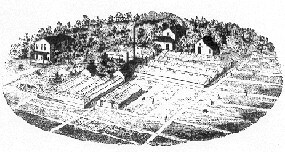 There are five cigar factories in the city employing quite a number of men and turning off goods that have won a wide reputation. Challenge Corn Planter and Refrigerator Works. The Challenge Corn Planter and Refrigerator works are as large if not larger, than any other similar establishment in the world. They are organized with a capital stock of $200,000. The plant occupies twenty acres of ground and has a capacity of five hundred men. Much of their machinery has been designed in the works and cannot be duplicated by any other manufacturer. The officers of the company are: W. C. Sheldon, president, Levi Scotley, superintendent, George Stickney, secretary and treasurer. These works are to be considered among the greatest industrial enterprise of Michigan. 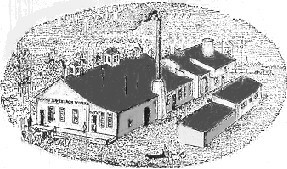 Tannery—Buildings of Grand Haven Leather Company. 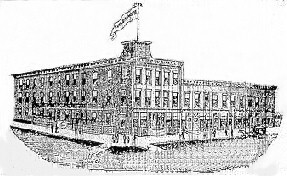 THE GRAND HAVEN LEATHER COMPANY. 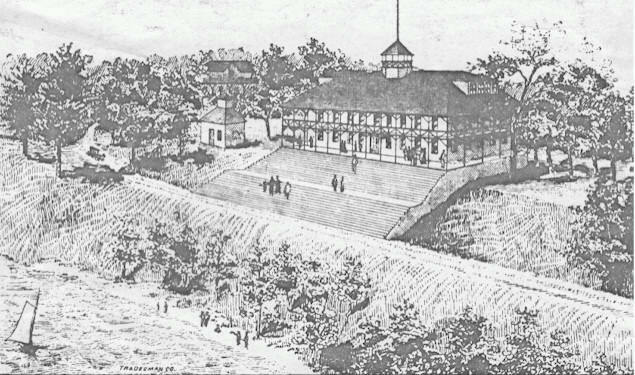 The Grand Haven Leather Company’s plant was put in operation in 1885, burned to the ground in 1886 and immediately rebuilt. they use a carload of between four and five hundred hides a week, and about 2,000 cords of bark a year. They employ forty skilled men the year around, and their business is increasing. They have all they can do to fill their orders. They have 300 feet of water front and dockage, and a branch of the Chicago & West Michigan railway to their buildings. The officers of the company are: A. J. Nyland, president, George Stickney, treasurer, John Vaupell, secretary. Grand Haven has an excellent fire department with the latest appliances for extinguishing fire. 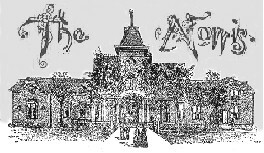 The Norris, J. F. Smallman, proprietor, is an elegant hotel, and beautifully located, its large patronage, of people accustomed to travel, is a guarantee of its success. John Duursema is a highly successful manufacturer of general baker’s goods, and makes a specialty of sweet goods. His goods are familiar to the trade in all parts of Western Michigan and have a large sale. Among the younger business men of our city, D. A. Lane, the book man, must be considered one of the most enterprising. He started in business here less than three years ago and has built up a trade in books, novelties and general supplies pertaining to that line, which extends to customers in all parts of Western Michigan. His trade in general school supplies is immense. 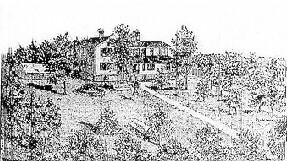 Residence, Green-Houses and Canning Factory of George Hancock. Grand Haven may justly take pride in her greenhouses and gardens, principally the result of the indomitable will and perseverance of George Hancock, who, though 74 years of age, is as active and enthusiastic in his work as ever. He was born in Devonshire, England, and came to this country about forty-two years ago. After following market gardening in New York state for several years he came to Spring Lake and engaged in lumbering. A few years later he again engaged in market gardening, moving to this city about thirteen years ago. He started his present location with one small greenhouse. He now has twelve, the covering of which consists over twenty-six thousand square feet of glass. From the first Mr. Hancock devoted considerable time to the growing of celery, being the first to introduce that important industry in this locality, and to ship celery from this county. It is estimated that there are more than five hundred people employed in celery growing in this vicinity. Last year Mr. Hancock alone shipped over five thousand heads. Market is found for celery in various sections of the country. About ten years ago Mr. Hancock added the floral department to his business, making carnations a specialty, and of which he now has over one hundred and fifty varieties, comprising all the newest and most desirable. He cut the past season over a quarter million carnations blooms. Another feature is the propagation of young carnations plants, especially the newest varieties. Last season Mr. Hancock added still another department to his business in the way of canning tomatoes of his own growing, putting up about thirty-six thousand cans. During the busy season it required at least fifty people to handle the different departments of Mr. Hancock’s business. 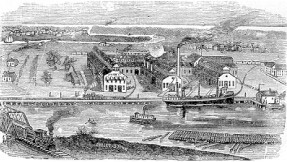 One of Grand Haven’s important and permanent industries, is the taking of fish for the market from Lake Michigan, employing five steam tugs, five sail boats, and about fifty men. The tugs cast their nets from fifteen to twenty-five miles from shore, and capture from 1,000 to 1,500 pounds a day. The sail boats cast their nets from three to six miles from shore and secure from 300 to 600 pounds each, a day. Chicago is the principal market. During the winter the Grand Trunk railway has about 300 men on its payroll at Grand Haven. A large proportion of them being freight handlers. They also employ many freight handles during the balance of the year. 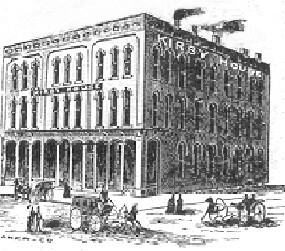 The Kirby house, Phillip Rosbach, proprietor, is an elegant hotel building, and enjoys a liberal patronage from the general public. The Andre house, Mrs. Ida Andres, proprietor, E. H. Andres, manager, is an exceptionally popular low rate house. Meals 25 cents; one dollar a day. Johnston Bros. Boiler Works, Ferrysburg, Michigan. Johnston Bros. are the big boilermakers of this part of the country. They manufacture locomotive, stationary, portable and marine boilers, tanks and sheet iron work. They employ seventy-five skilled mechanics, and at this writing have sixty-nine orders for boilers ahead. They have all the labor-saving machinery and appliances known to the trade and turn out work upon the truly wholesale plan. The members of the firm are Thomas and J. B. Johnston, and they have grown up in the business. Phoenix-like, the new Cutler house has arisen from the ashes of the old and will be equal to it in every appointment. It has the capacity for one hundred guests. That it will be fully equal to the former Cutler house is all the assurance necessary. W. L. R. A. Andres is the proprietor and will exert every effort to maintain its reputation as one of the leading hotels in Western Michigan. Iron Works of Henry Bloecker & Co. The above name is familiar to steamboat men along the entire chain of lakes on account of the reputation the firm has made in the manufacture of marine engines. They also manufacture stationary engines, iron and brass castings, general sawmill and steamboat work, job and repair work, wood turning, etc. They are also patentees and manufacturers of the most reliable circular saw guide in use. Henry Bloecker is at present sole proprietor. They employ from thirty-five machinists, and their payroll is important to Grand Haven. Though recently organized, the Grand Haven Furniture Company is now doing a thriving business in their new and excellently equipped plant. Every piece of machinery about the establishment is is new and of the most approved pattern. Grand Haven furniture has already become a staple article in the market of the best, and the demand exceeds the supply. The officers of the company are: S, H. Boyce, president ; K. T. Van Den Bosch, treasurer. 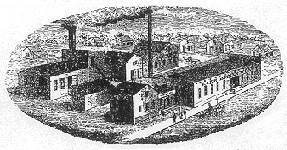 Factory of Silas and Kilbourn & Co. The main business of this enterprising firm is the manufacture of cooperage and woodenware. Its specialties are fish packages, pickle and cider barrels and kegs and sirup kits and kegs. Its shipments to all parts of the country are enormous, as will be readily understood when conversant with the fact that eighty people are continually employed in the manufacture and assisted by all the latest patterns of labor-saving machinery. Jacob Baar is the only real estate agent in Grand Haven, and does an extensive business, handling property, not only at home, but in all parts of the country. John A. Pfaff is the sole proprietor of a live insurance agency in Grand Haven. He is also interested in the insurance business in Grand Rapids. Pfaff Bros. are leading hardware men. James Barns furnishes Grand Haven people furniture at bottom prices and it quantities to suit purchasers. George D. Sanford is the representative of many leading insurance companies and his agency has a large patronage. Of the two Grand Haven ship yards only one is in operation at the present time, that of the Grand Haven Ship Building Company, Duncan Robertson master builder. Many of the best lake-going craft of the different classes attest to the skill of Grand Haven ship builders. 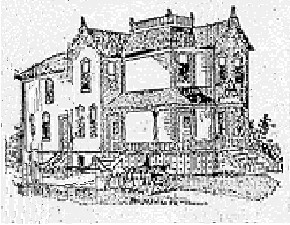 Residence of Sherman K. Boyce. Van Den Bosch & Bros., general merchants, are one of the most extensive and enterprising firms in Ottawa county. Their stores are are filled with all the different lines known to the general trade excepting hardware, toys dry goods, crockery, gents’ ready-made clothing, etc. As local financial backing, Grand Haven has the National bank, with D. Cutler, president, and George Stickney, cashier. Few lawyers in Michigan have have a larger law practice or are better known than Hon. George Farr. Beaudry & Co., though heavy losers in the big Grand Haven fire, may be classed among the leading dry goods firms of Michigan. Dr. A. Rysdorp and Dr. E. P. Cummings, two of the more skillful dentists in Western Michigan, are located in Grand Haven. J. Brandstetter carries a large line of jewelry and a complete line of sporting goods and fishing tackle. James Lewis runs a first class planing mill and manufactures picture stretchers, easels, etc. Geo. D. Turner is the only proprietor of the only set of abstract books in Ottawa county. He furnishes abstracts on short notice. Enos Stone is the leading Grand Haven livery man and no city in Michigan can boast of a better outfit of horses and carriages. James J. Danhof does a safe lumber business and has recently become sole proprietor of the Akeley block. N. Robbins sells more coal than any other man in Grand Haven. Coal is his business hobby. James Connell is the only plumber in Michigan that does work cheap and of course is always busy. B. C. Mansfield carries a fine line of jewelry and makes optical goods a specialty. Unlike towns depending upon the manufacture of lumber, soon to pass away, Grand Haven people have confidence in the future of the city and from this brief newspaper sketch in which her leading advantages and enterprises can only imperfectly appear, it will be seen that she is far in the lead of the great majority of cities of her population, and that as Western Michigan develops she is bound to increase greatly in size and prosperity.